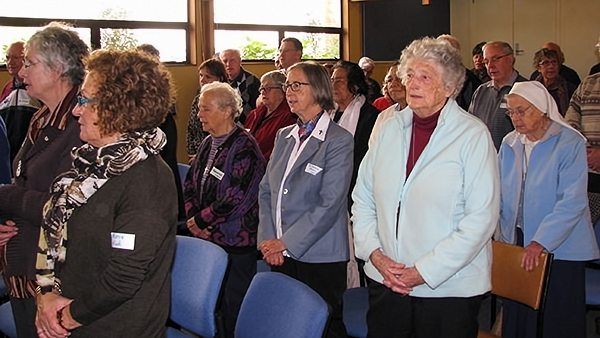 Marists from around New Zealand gathered on Saturday to mark the bicentenary of signing the pledge at Fourviere. 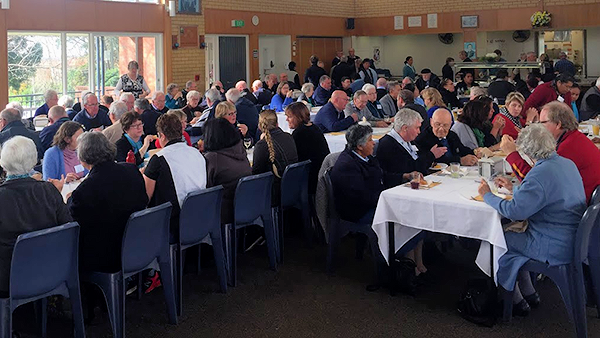 The occasion brought the family together: Marist Laity, Marist Sisters, SMSM Sisters, Marist Brothers and Marist Fathers, all whom gathered in Whangarei, Auckland, Taradale, Wellington and Christchurch. The format throughout followed a similar pattern; prayer, reflection and a meal. 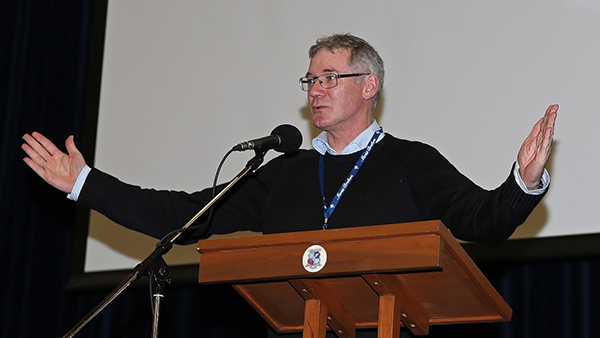 A highlight of the Auckland celebrations was the celebration of mass presided by Marist Fathers’ provincial Fr David Kennerley, who also preached. 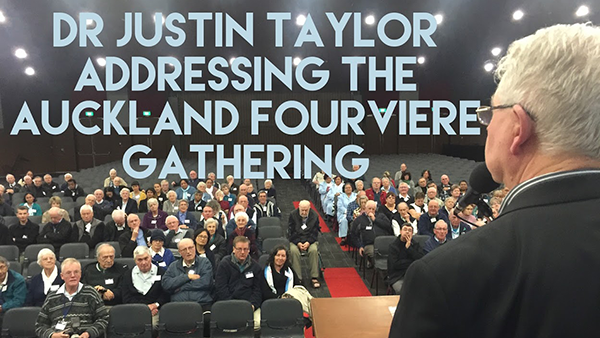 A keynote address by Dr Justin Taylor SM had been given in the morning and workshops on a range of topics occupied the ‘post-festive lunch’ afternoon. 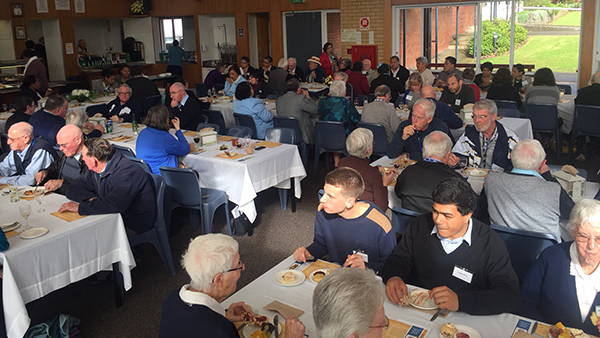 It was a full house at the Pa Maria spirituality centre, Wellington where the theme was “Fourviere in the Year of Mercy”. 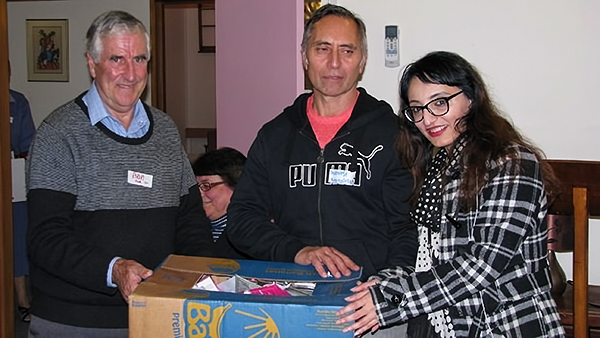 Those coming to the Wellington event were asked to bring a gift of school material for refugee children and such was the generosity that a huge collection of about eight heavy banana boxes were delivered to the archdiocese’s “Mountain of Mercy” effort. 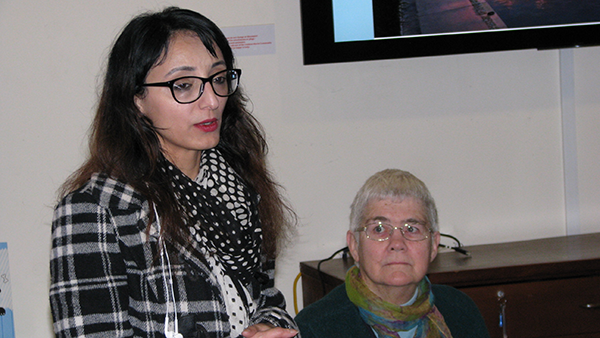 The Wellington gathering also had the pleasure of listening to presentations from representatives of all branches of the Society. 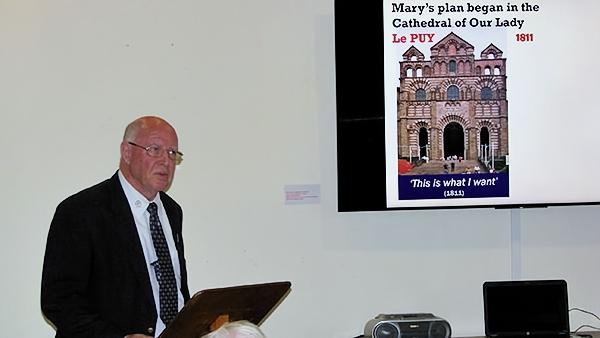 Around 80 gathered at St Mary’s Taradale for mass, meal and a visual presentation. Damian Caccioppoli presided at the mass and John Mori preached the homily. 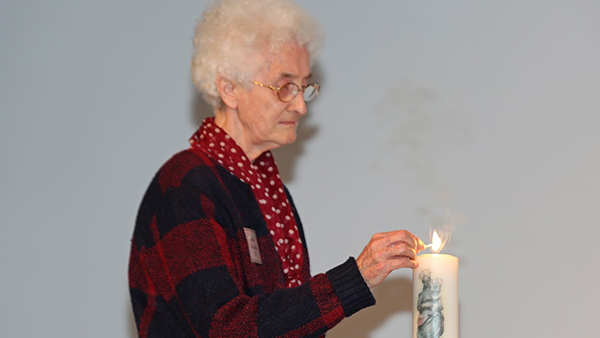 According to a Christchurch report, “in the near Antipodes of Fourviere”, the eldest Third Order member in New Zealand, Mrs Ngaire Mahoney, mother of Michael Mahoney SM, held the taper lighting the mass candle. Hymns for the mass reflected the Marist origins and today. 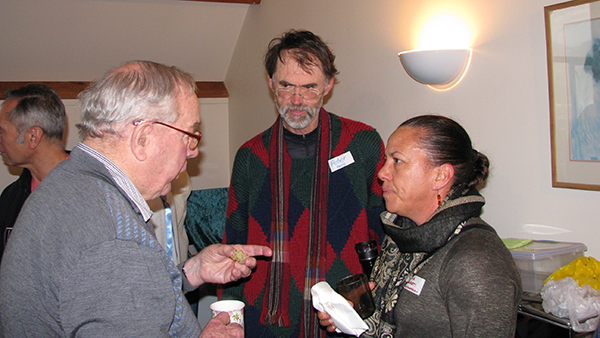 They were in Latin, French, Māori and English. 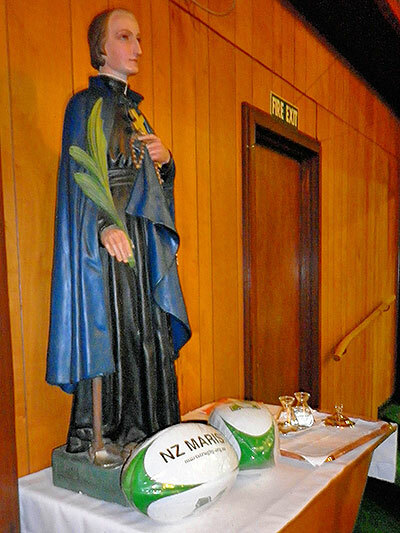 Further inculturating the commemoration, during Fr John Craddock’s homily two rugby balls, professionally branded “NZ Marist” along with a silver fern and green trimmings, were laid at the foot of St Peter Chanel’s statue. The 300 strong ‘crowd’ applauded the “try”! 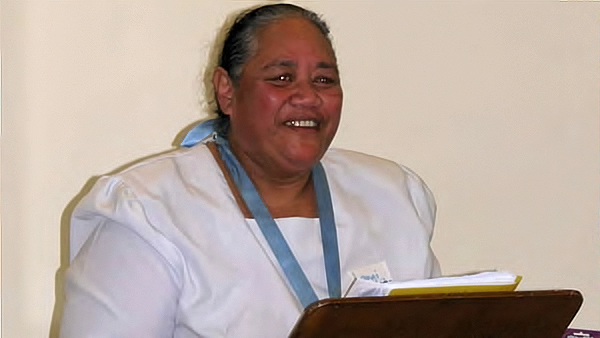 The rugby balls were gifted to a Wallisian sister for the Futuna Island; where Peter Chanel shed his blood for the Marist project, and the students of Catholic Cathedral College who were well represented at the celebrations. 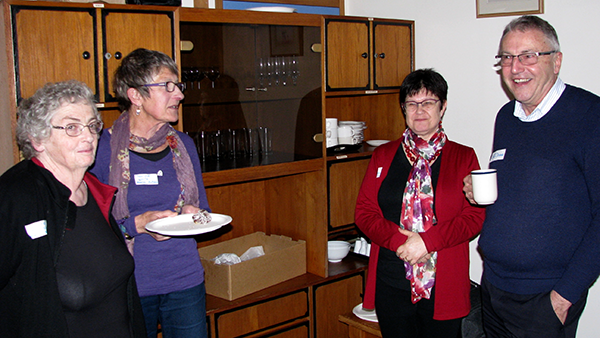 While some from the North traveled to Auckland, around 20 Marists from Whangarei and Okaihau gathered on Sunday evening for prayer, a meal and some social time. Information for this account was submitted by people from around New Zealand. It is sometimes hard to get information on a Monday so there maybe more to come. It can be easily added. Many thanks to the photographers, Rowan Donoghue, Merv Duffy, Terry Manning, Marie Challacombe and those whom have yet to be identified. 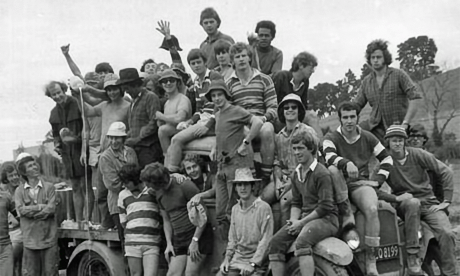 Marist seminarians (1976) stop for a photo during grape-picking. 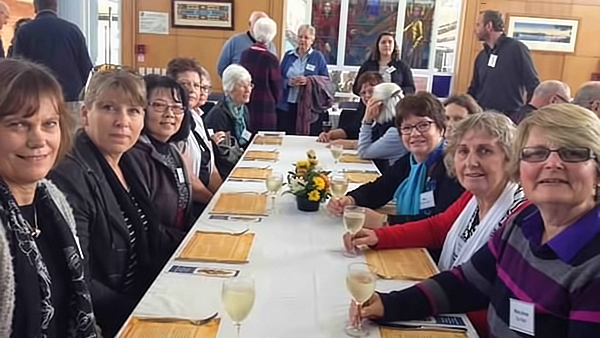 Marist seminarians from the 1970’s onwards are being invited to a reunion with a purpose; to see where their mission is taking them now. 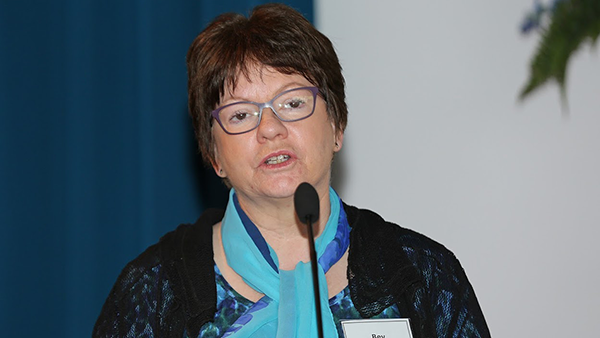 “Our years at Mount St Mary’s were some of the most memorable of our lives. Let’s re-live the memories, re-invogorate the friendship and share where our Mission is taking us now”, say the organising committee in their invitation. 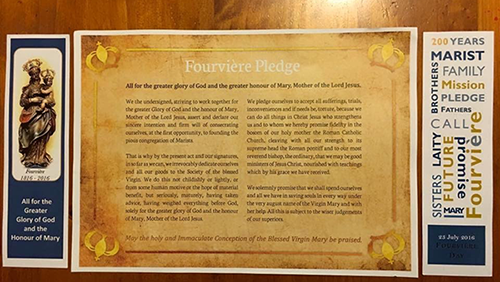 The committee, Gerry Forde, Shaun Davison, Dennis Farrelly, Nick Pendergast, Mike Fitzsimmons and Chris St Clair have put together a programme that includes being jolted awake with the customary 5:55am seminary bell, followed 30 minutes later by morning prayer. 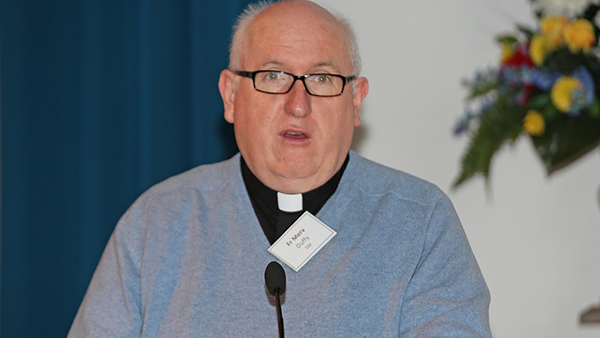 The provincial of the Society of Mary, Fr David Kennerley will welcome participants and bless the occasion. Other key moments of the weekend are a discussion of a “Marist Alumni proposal” and the laying a plaque for old boys who have died. 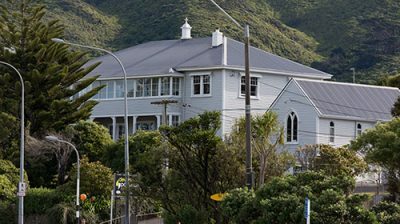 The weekend also has its lighter moments with a tour of the new cellars, a “high tea” in the Mission Estate’s award winning former chapel restaurant, singing the top ten hits from the hymnal and the opportunity to chat over a few wines late into the night. 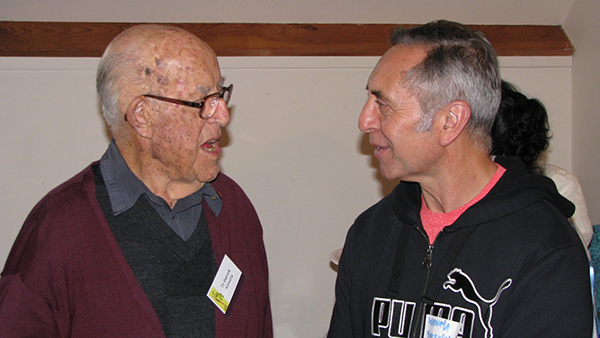 The reunion at the once Greenmeadows seminary, now historic Mission Estate Winery, follows several successful catch-ups around the country to mark the launch of the book On a Mission, edited by Shaun Davison. 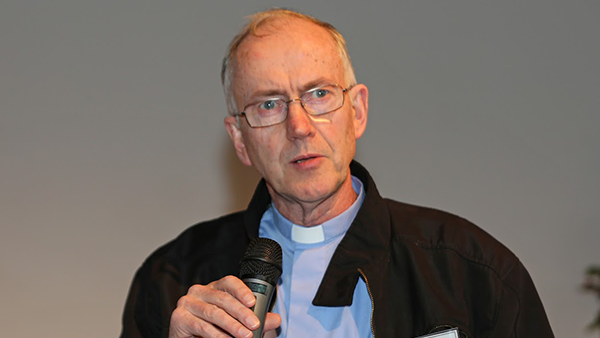 The reunion is for seminarians from 1970 onwards, and takes place on the weekend of 10 – 12 April, 2015. Places are limited to 180, including partners. Those interested are welcome to contact Gerry Forde or visit Facebook. 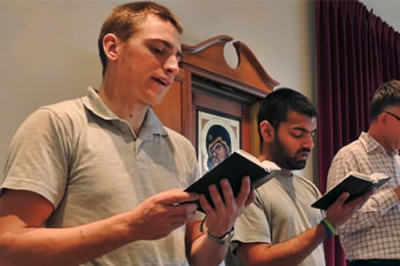 Nine young men have taken part in vocation discernment weekends at Marist Seminary this year. 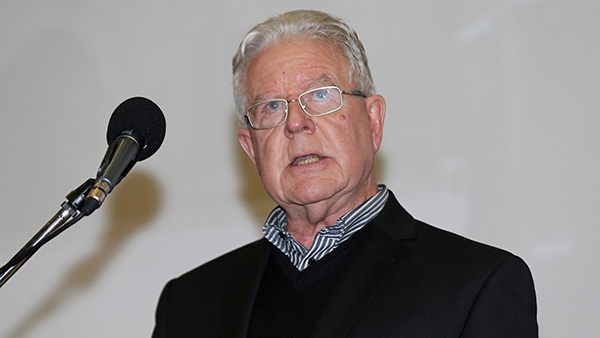 The opportunity to see Marist life up close proved more popular than expected, says Seminary rector, Fr Peter McAfee. 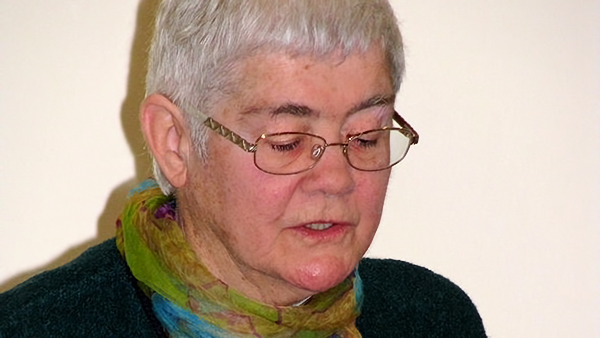 In January, Marist Seminary ran a discernment weekend. 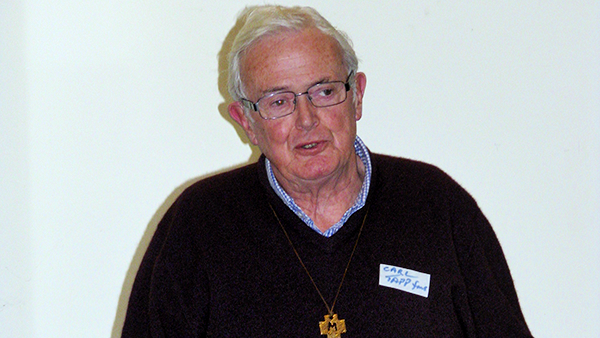 It was a live-in experience for young men considering a Marist vocation and due to the surprising level of interest the event was repeated 25-27 April. The discernment weekends run from Friday to Sunday. 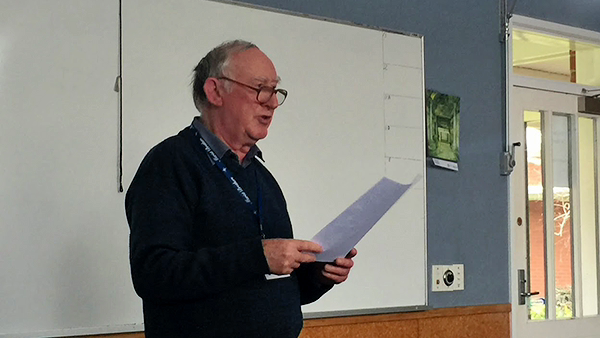 As part of the introduction to Marist life, the participants experienced seminary life. There was a mix of community and personal prayer, class, a chance to speak with a priest or seminarian, social time, personal time, Mass and meals together. The team, Frs Matt Crawford and Peter McAfee and seminarians, Phil Bennenbroek, Brendan Jenke and Hayden Powick agreed that the event was more positive than they could have expected. 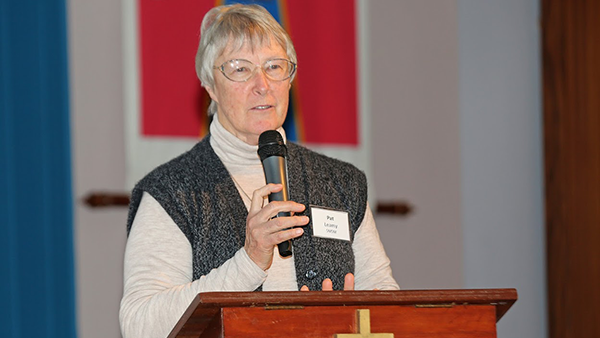 Comments from the participants were also positive; they were struck by how ‘free’ or un-worried the Marists were. 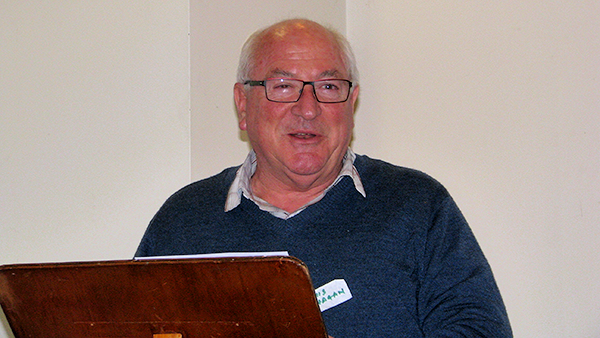 The next discernment weekend is from 7:30pm August 1- 1:30pm 3 August 2014. Those interested are welcome to contact Fr Peter McAfee. 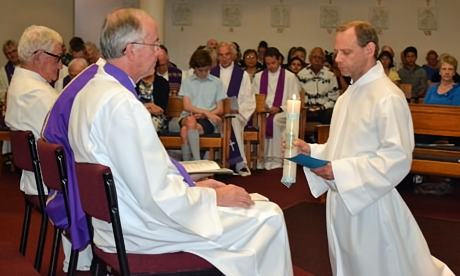 Philip Bennenbroek made his perpetual profession as a Marist in Whangarei on Saturday 22 March. 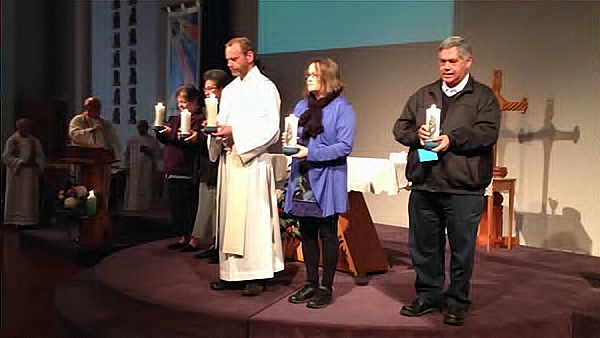 Phil’s parents and 15 Marists joined the parishoners of St Francis Xavier parish for the occasion, which was part of the Sunday vigil Mass.